I've got a bag of Oracle PL/SQL tricks that I carry around with me from project to project and one of them is a simple little function I created to "profile" a string. Profiling strings is a useful technique when your not sure what data is contained in string that might contain alpha, numeric and and when your wondering if their are patterns in the way strings are constructed. Phone numbers stored in databases are typically very unstructured. Do they have the "country" code? Do they contain parenthesis or dashes? Many times you'll find Product ID's type fields that are supposed to comply to certain rules (i.e. Two alpha characters followed by 10 numeric characters). Please tell me you don't store these in your database, but if must do so in fact you can take a peek at how they are constructed with the below function and query. In this example, I've loaded up about a thousand phone numbers from a real world database where most of the numbers are "US centric". As you can see from the results of the query, the formats (or "string profile") of these phone numbers are really all over the map. As you can see, I've replaced numbers with the number "9", capital letters with a capital "X" and lower case letters with a lower case "x". All other characters I've left in the string as these other characters have been important for the use cases I've implemented this code for in the past. If you've got a good eye (or you've drank plenty of coffee today) you'll notice that the last result looks very much like the first record. I took another look and noticed that this particular record had trailing spaces and my PL/SQL function doesn't account for that. So, it's not perfect but like I said, this code is right out of my toolbox and I've used it before on close to a dozen or so projects, so although not perfect it's still very helpful. In this second result set, noticed how all the alpha characters (both upper and lower) have come back with an upper case "X". At this point in my RegEx career, I haven't been able to figure out how to correctly use the "match parameter" capabilities that I think might assist in correcting this (or perhaps the :upper: and :lower: classes would help?). This second example is perhaps all you need if you'd like to profile strings without installing any of your own custom PL/SQL objects. I've also seen results of string profiles created with RegEx expressions that look like "A9" - where the string is a nine byte string of alpha characters. I haven't seen a database implementation of this format yet and at this point I haven't had a need to write one. 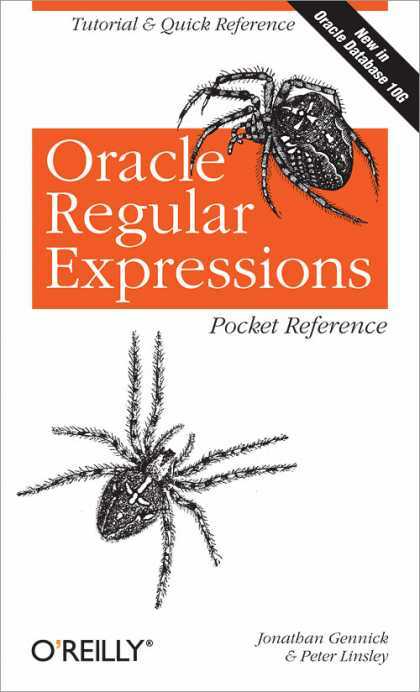 If your interested in RegEx within the Oracle database, I'd recommend you pick up the "Oracle Regular Expressions" pocket reference, it's quite useful. If you find yourself doing tasks like this very often, there are "Commercial Off The Shelf" (COTS) products that take this to a level far beyond what you could ever do yourself. These tools are called "Data Profiling" tools and vendors like DataFlux and Trillium are excellent choices. Both have very intuitive user interfaces and are extremely powerful tools that can immensely benefit organizations who understand the value of a Data Profiling. Many times the need for a more powerful tool such as these data profiling tools even spark cultural changes in an organization and Data Governance and Quality programs begin - which is what happened at my current shop - but that's another story (blog entry). Great post Rich- this kind of data format analysis is extremely useful. And its often amazing how many variations users are able to come up with. Every time I see a data set that needs this kind of analysis, I think to myself- can we try to put constraints on the field at the point of entry? Of course, thats not easy either since in different parts of the world different formats are valid- but its a battle that is best fought as early as possible. That being said- techniques such as those you show here will always be needed. Good stuff. Great post Rich, I'm a big fan of developing scripts internally to cut costs, get some momentum and identify some low-hanging fruit to fund more advanced technology.